Caeli: You recently made headlines when it was announced that you were leaving your spot in the first violin section of the Philadelphia Orchestra to take over as concertmaster in Indianapolis. You were here in Philly for five years— and you were ridiculously young, 22 and just out of Curtis when they hired you. What made you decided to leave? Zach: (Laughs) Nobody in their right mind would want to leave Philadelphia Orchestra! But seriously, Indianapolis is a really great orchestra, a wonderful ensemble. And the concertmaster position is a new challenge, so how could I resist? Indianapolis is offering me a lot of flexibility, and they're very much supporting my chamber groups. I'm from the Midwest, so for me this is a homecoming. I'm hoping to be able to say "pop" again instead of "soda". Caeli: We'll miss you! Will you ever come back? Zach: I'd love to sub in Philly if they'll have me. I love playing with those guys. They're monsters. Caeli: You grew up in a family of musicians, four brothers all playing violin. I think I can relate to that, having three sisters myself. Zach: I was the baby of the family. Growing up, I loved celebrating my brothers' accomplishments. The four of us have always gotten along, no sibling rivalry. And, as the youngest, so much of what I learned was directly from them. But I was also always trying to make my own path. The challenge for me was trying to figure out when to give them props and when to strike out and do something on my own. Caeli: Did you feel you could become anything other than a violinist? Did you even want to? Zach: To tell the truth, it wasn't my idea to start playing violin, and I wasn't particularly thrilled with the idea at first. When I turned five my dad just said, "Zach, you're gonna play." My dad's a composer, and he's always been concerned that music education is neglected in schools, so he thought he'd make it a focus in our lives at home. Here's how it all started: my oldest brother, Wally, had a coordination problem when he was little—he couldn't catch a ball if you threw it to him—so the doc said that he should do piano or violin. My dad picked violin because he'd always loved the instrument, and it totally straightened Wally out in no time. Then, since we already had that little 1/8 size fiddle, Alex got his turn when he was old enough. It was a hand-me-down system. After Alex, Jason began at age five, and a few years later it was my turn. I was a pretty reluctant player in the beginning. Caeli: Did all four of you share a teacher? Zach: No, our dad was very careful to pick the right teacher personality for each boy. I started out in the Suzuki studio of Grace Baker. Then after a year I moved to the private studio of Vasile Beluska, a professor at Bowling Green State who's originally from Romania. Caeli: You four were all trained in the classical tradition. When did you get into fiddling? Zach: Immediately. In the Midwest there are a lot of fairs: county fairs, state fairs. When I was a little kid, my older brothers would camp and do fiddle contests. 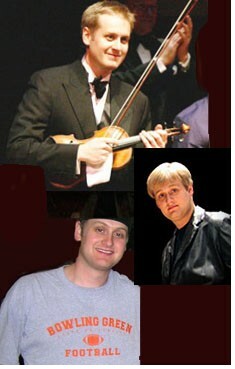 As we started growing as a performing group we always incorporated the fiddle tunes my brothers had learned. It was totally natural for us. We've been performing professionally as the DePue Brothers for eighteen years. As we get older, our professional schedules are increasingly challenging to juggle, but we're planning plenty of upcoming concerts, including a holiday show later this year. Caeli: Let's talk about your conservatory years. You were at CIM for a few years before you came to Curtis. Zach: I didn't get into Curtis the first time I auditioned, so I went to Cleveland. I loved CIM, but it was a bit pricey. And I had a chip on my shoulder about Curtis, to tell the truth. So I re-auditioned, thinking that if I got into Curtis, I'd use that as leverage to get more scholarship money at CIM. That didn't work out, but my teacher at CIM, Bill Preucil, took care of me. He called Jaime [Laredo] and Ida [Kavafian] and they took me into their studios. I was 19 when I got to Curtis and my brother Jason was already there, and I had friends there already. I've been so lucky. All of my teachers have turned out to be amazing, and the quality of students there is so high that you can't help but absorb so much from them. Caeli: And Curtis is where you met the rest of Time For Three. Zach: I met Nick (Kendall) the summer before I came to Curtis, at the Verbier Festival in Switzerland. My brothers Jason and Wallace were there, too. Growing up, we'd always made extra money busking together. So, the three of us decided to team up with one of Jason's bass-player friends for Curtis, and then another violinist, this guy with the hair asked if he could tag along. Caeli: (Laughs) That would be Nick. Zach: The five us played tunes we'd played as a family together on the streets of this major music festival, and a lot of people heard us. There was a big buzz. Then, when we got back to school it happened to be Curtis' 75th anniversary year and we were asked to play fiddle at some parties. At first, our bass player was John Keigwin with Jason, Nick, and me and fiddle. But after a while Jason decided that he wasn't all that into the fiddling and improvisation, so he dropped out. Then one day, our bass player's roommate, Ranaan Meyer, another bass player, subbed for John. Caeli:. Finding out that there was a bass player before Ranaan—it's like finding out there was a drummer before Ringo! Zach: At that very first gig, the audience loved our music so much that we ended up partying with them and playing all night. We thought, we should do this again! Caeli: And Time For Three was born. So, how does your "wildly popular crossover trio" (as I've heard it described in the press) fit into your life as a classical violinist and member of top orchestras? Zach: My priority is to keep an equal balance between the trio and my own personal career. I've always loved playing concerti with orchestra, but I didn't love it enough to pursue a life of fighting and scrapping to play with the Podunk City Community Orchestra of Southern North Dakota. However, I did love chamber music, and loved being part of an ensemble. So I figured that, after concertmaster, which was my dream from age 16, and which would give me the occasional chance to be a concerto soloist, my dream was to be in an ensemble like Time For Three. Caeli: It sounds like a perfect life. Zach: I've always wanted to be part of a team. I did a lot of chamber music as a student—in high school my piano trio went to Fischoff. And when I got to CIM I immediately formed a quartet with my friends. Caeli: You were also a winner in the Senior Division at Fischoff. Zach: Yes, my freshman year at CIM, our quartet came in third. Caeli: What's the difference between playing in a classical chamber group and a crossover group like Time For Three? Zach: There isn't one. It's the same standard. We treated every performance like it was Carnegie hall. It's such great groundwork mentally to be in that mindset, to always play every concert like it matters. Caeli: You do a lot of improvising when you perform with your brothers and with Time For Three—have you ever tried formal composing or arranging, like Ranaan does for your trio? Zach: I haven't done formal composing since I was seven. My mom died when I was six, and the whole family was struggling with it. I wanted to write a piece of music about those feelings, so my dad sat at the piano and I started singing. He wrote it all down and spent hours working with me so that I could get out on paper what was in my head. "Mama's Waltz" was a 3 or 4-minute piece. It won a children's competition—my dad was always sure to enter us in competitions if he could!—and he wanted me to continue composing, but by then I was too fixated on playing violin. Now, however, I'm feeling inspired by Ranaan and his composing. I have so many tidbits that pop into my brain, especially when I'm going through a period without listening to much music. I need to start sketching it all down and organizing it. Caeli: You've accomplished so much already and you're only 27. What does the future hold for you? Zach: I always feel that we're capable of so much with our instruments. I don't think every instrument can do what we can do on the violin; we're versatile in so many ways. Anyone with a passion and a violin will find so many outlets for their art. There's no single path to take. I love playing; if it ever starts to feel like a "job" then I would probably want to do something different. We're never bound to anything in life. Right now, I feel thrilled with my life. I feel very lucky to do what I do. June 29, 2007 at 08:15 PM · Great interview, Caeli! I've been such a fan of T43 since I discovered them a year ago and it's great to learn about one of the members in such depth. I had to laugh when Zach mentioned saying "pop" instead of "soda"; after going to school on both coasts for years, I knew I'd left a part of myself in the Midwest forever when I started saying "soda". June 30, 2007 at 03:32 AM · Thanks for the great interview! Zachary's name didn't sound familiar, but I could have sworn I'd seen his picture before. I had to think a second, but then I remembered — he's one of the musicians featured on the documentary "Music from the Inside Out," (which centers around the Philadelphia Orchestra). There's some nice interviews and a great clip of him playing bluegrass! It was great to learn a little more about his background - thanks again for posting this. June 30, 2007 at 06:35 AM · Thank you, Caeli, for another great article! I just want to say welcome back as Violinist.com's summer intern this year! June 30, 2007 at 12:40 PM · Great interview! One of his brothers, Alex De Pue, plays country, bluegrass, etc and is touring with Steve Vai all over the Europe at this moment, I believe. I would think Zachary DePue is very exposed to bluegrass. All four of them are extremely talented, but what struck me most was how they all are very personable with easy smiles and friendly hi's in my brief to extended encounters with them.